DMs can never have enough resources for their games. They have so much to take care of in the game that having some pre-generated material is nice. 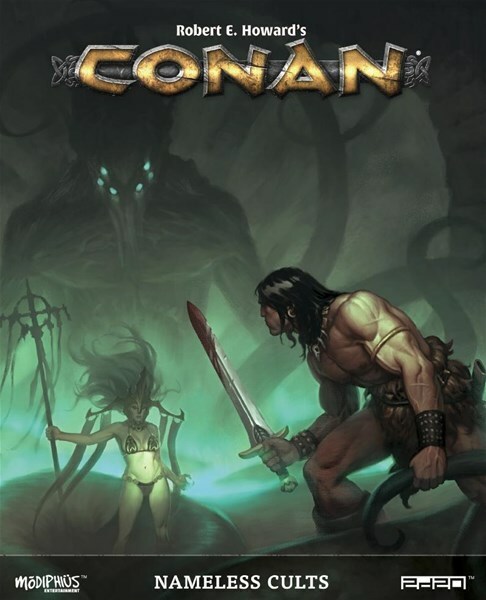 In this case, it's a new book for the Conan RPG. It's called Nameless Cults and it has all sorts of information about Hyboria's various gods and those that worship them. Nameless Cults is the Gamemaster’s indispensable guide to the cosmology, gods, cults, and otherworldly entities of Conan’s world and time. This sourcebook addresses the many gods and godlike entities of the Hyborian Age, delving into their cults, their priesthoods, and the strange and terrible rites of their followers! Descriptions of major deities like stern and remorseless Crom; Bori, father-god to the Hyborians; benevolent Mitra; sensual Ishtar; and the serpent god Set. Minor gods such as Asura, Derketa, and Bel; and regional cults such as that of Alkmeenon, the cannibals of Zamboula, and the immortality seeking Zugite cult. Writeups of potent foes and allies such as Thog the Mighty and the eminent Kalanthes of Hanumar, enemy of Thoth-Amon. Descriptions of sacred relics and tomes such as the Bone Rattle of Jhebbal Sag, the Fire-Jewel of Hell, and the Tablets of Destiny. New cult member archetypes, including the Cultist, Oracle, Philosopher, and Pilgrim, with stories, backgrounds, and other suggestions for roleplaying the faithful. Horrific, mind-bending lore about the Old Ones: Cthulhu, Yog-Sothoth, Azathoth, Nyarlathotep, and other terrible deities of the Cthulhu Mythos created by H.P. Lovecraft and integrated into Howard’s Hyborian Age.